There’s one minute left until the bus arrives, and you’re eager to get on that blessed 51B and finally go home. Yet as the time ticks down, it suddenly jumps up to 11 minutes until the next bus because the universe just hates you, damn it. And though we love the public transportation in Berkeley, especially as an alternative to the money drain of ridesharing services, sometimes it leaves a lot to be desired in the convenience department. 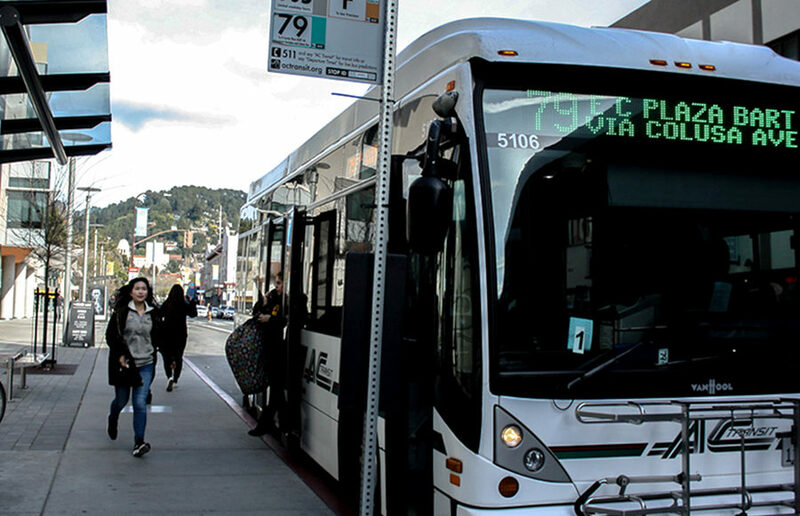 It’s not too big of a deal with more routine trips, but when you’re trying to get someplace new aboard AC Transit, things can get a little bit wonky. So Transit says the bus will be here in four minutes, Google Maps says it’ll be here in 12 and NextBus says… that the bus doesn’t exist? What? You just saw it running down College Avenue yesterday. Guess you’ll have to go the old-fashioned way: wait at the stop and pray to the bus gods that it comes. Hope there are other people waiting too, so you won’t be alone if you’re wrong. You pull out your phone again as the bus pulls over at yet another bus stop — not to check Facebook again, but to count off as you near your destination and double-check that destination in case you’re wrong. What if the driver somehow misses it? What if you miss it and forget to request a stop? What if you call a stop too early and no one gets off and then it’s awkward? Some public transportation apps have this fancy feature where you can follow the progress of your bus as you go — it has the bonus feature of helping you realize how the distance to your destination and your level of stress are inversely proportional. It’s a cool little gimmick of modern technology. Okay, now you’re just getting paranoid. And your GPS is a little bit wonky anyway. And you’re using up your data. Is this really necessary? Wait, so what stop are we at right now? There doesn’t seem to be a consistent announcement system about exactly which stop the bus is at right now. The voice goes on strong for the first few stops that you get on, then it mysteriously falls silent as you near your destination. You start desperately scanning all the street signs: College Avenue and what? Were you supposed to get off by now? Yeah, we all knew this was coming. At least you’re only a block (or 10) away from where you should be, right? Probably should’ve just taken that Uber. Contact Jonathan Lai at [email protected].